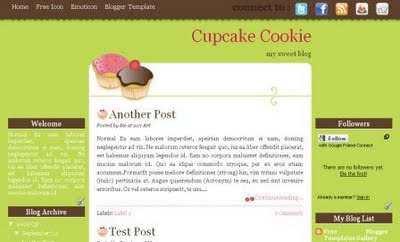 Introducing my another cupcakes blog design. I use cupcake vector from Clarice , thanks Clarice for your permission. This template has two combination color, chocolate and green, haha not pink anymore. Three columns with unique and cute cupcakes header image, suits your cake, candy, cookie, cupcake recipe blog. Change to your own username/ID in every social bookmarks account. You should have account. Dont need all social bookmarks? Just delete each code. Tapi kok dr dulu bikin template'x tentang kue ya..?? I created another blog hehe coz i want to use this.. How can i remove the read more function? I love the "connect to" links at the top. I'm currently using your Girl Mag template on my blog and loving it. I actually just switched it last week from another of your templates, Flower Garden 3 column. i'm currently using your Momochi template. really love it. thank you. is there any resolution for me to use this template without the cupcakes? btw can i change the bg? if i use this template can i change those header image?? Long Time not visit your blog dear,how are you? Absolutely love this template!! The colors are wonderful, it's adorable. I'd also be interested in how to remove the "Continue Reading" function, so that the entire post is displayed, instead of having to click to see the full post. I have uploaded this template and have switched it over to my blog; however, I do not have a navigation menu at the top and no way of adding new posts! Plus, when I click on the social bookmarks, they're going to someone else's page and not mine as I cannot edit it! Can you please help me find my navigation menu?! Thanks! I figured out the navigation menu, but I'm wondering if I can change my side wrappers to "continue on" like the posts do in the body. I saw above where you provided the code to stop the continuation, but what would I add and where would I add for the code in the side bar content? I have a question on the deleting the "continue reading"
Do I delete everything that you posted on the #4 and just type what it is in the #5? How do I do that? I need help pleeeease !!! i cannot download this template ;( why? Hello! Thank you for designing this beautiful template. I have a question: How do I change the color of the sidebar widget headers? And another question, the "Older Posts" and "Home" links moved themselves from the bottom up to the middle of the page. Can you advise on how to fix that? Please? First of al, I realy like this one! It's so creative and fun, my compliments! Sorry for my bad english (i'm dutch). I was wondering if there is a posibility if you can make a template just like this one, but one I can use. I just can't find the perfect one. I had something in mind and it looked just like this one, only pink(ish) and more make-up(ish). It's for my make-up site. I do tutorials, reviews and so on. Well, I hope you can help me. Thanks for sharing the information over here. Now people can easily use this template as you have also provided the procedure to do it here. Love this template. Super cute! This is the best food template I've seen in a long time. It's fun, it's got my fave colours and it's not too frou-frou. Very well done! And I soooo downloaded it! I just love your weblog! Very nice post! Thanks very much for sharing this post. keep posting, I'm looking for some more information from you. Anything with cupcakes in it has to be good! hmmm cupckaes . . . any coffe templates? Cant wait to clean up the posts problem! thank you!! Still struggling with getting the comment button and share buttons on the bottom of each post... any ideas? thanks a bunch! FYI tried to use search button but its not working. hi pears, that template is built before Blogger apply share button. It needs more tweaks on HTML Code. great template!Thanks for taking the time to discuss this, I feel strongly about it and love learning more on this topic. If possible, as you gain expertise, would you mind updating your blog with more information? It is extremely helpful for me. Cupcake templates are fun, colorful, and good to have on a site. Good post thanks for the share! Thanks for taking the time to discuss this, Its really best and interesting topic. i love cupcakes and i love cookies! Thanks for the post. It was very interesting and meaningful. Keep posting. I bookmarked it. Hello! Thank you for designing this beautiful template. I have downloaded and adjusted it and I am almost happy! Hey….you write articles really well…the article kept me hook at my pc till the last sentence. You know great stuff about fashion must say! Thumbs up!!! which helps us to attract customers feedback. This helps us achieve our ultimate goal of customer satisfaction. Thanks for nice info! Looking forward for your updates and try insurance like cheap insurance quotes online, also instant auto insurance comparison is available. I really loved reading your blog. It was very well authored and easy to understand. I also found your entries very interesting. Chocolate and green is a good combination, have you tried olive green and gold, though? It is much better for our eyes! thaks very much, all good. I had this content bookmarked some time ago but my notebook crashed. Very useful post! Valuable information and excellent design you got here! I would like to thank you for sharing your thoughts with us. I appreciate your nice post and comments. Thanks for sharing. Let me welcome you to cheap insurance quotes from leading auto and home insurers. If you prefer to choose home insurance online it would be better to compare home insurance by zip code for free here. nothing like prepare cupcakes with the family, you know a Sunday in the evening you almost have nothig to do, so take the family go and buiy the ingredients for some cupcakes, and enjoy a good day with your family. It is wonderful read really great news. Let me tell about cheap homeowners insurance that will allow you to save on house protection policy. Don't hesistate and apply for homeowners coverage just now! It's great read the right post. Let me tell about home or auto insurance which will help you to search for low cost home protection and pay less on your policy. To make this you need compare rates on home insurance by zip code and choose the most affordable coverage that suits your needs. I'm happy to see really useful news. Let me tell about poker affiliate programs which will help you to increase earnings on poker affiliate programs. I just want to let you know a little bit about cheap home insurance. Customers could have a great possibility to receive cheap state farm auto insurance within few minutes by zip. Great post! This really is just remarkable,i appreciate your blog site and bookmarked it. I love to use the Fruits juices because Fruits juices are good for the health as well as for the fitness of the body. Some of the benefits are good for heart, strong bones, Growth and development of the body, sharp mind and many more. Thanks for the information. I’m really glad that you share your ideas about this. I must relay this ideas to my friends. I believe this blog post is one of the most informative thing not only for the technique learner but also for necessary for all Buy Nexium stage people. Took me time to read all the comments, but I really enjoyed the article. It proved to be Very helpful to me and I am sure to all the commenter here ! It’s always nice when you can not only be informed, but also entertained ! I’m sure you had fun writing this article. I have been visiting various blogs for my research work. I have found your blog to be quite useful. Keep updating your blog with valuable information. The thoughts are very well laid out and it was refreshing to read. I was able to find the information that I was looking for. I just wanted to leave a comment as a token of appreciation. Thanks for sharing this on the Net. It took me several days to read it because I’d read it in snippets, leave to do something else, and then come back to it. I became anticipating intended for this type of write-up so I currently have attained various valuable details made by this web site Appreciate your sharing giving this level of detail, there is absolutely no far better strategy to grant details to opportunity seekers than you are on in this way. Came across your blog when I was searching bing I have found a lot of info that I found to be quite useful. experience in knowing about the various film events.That is really helpful for the people to spend our time This post is very useful for the people in knowing about the great events.It is a finest of all the in a great manner to make it everything useful. I think it is good through other people’s comments.Although I don’t understand most of your blog. Wish your success. Thanks for posting this article. I am definitely tired of struggling to find relevant and intelligent commentary on this subject. Everyone nowadays seem to go to extremes to either drive home their viewpoint or suggest that everybody else in the globe is wrong. Thanks for your concise and relevant insight. Substantially, the article is really the best on this laudable topic. I concur with your conclusions and will eagerly look forward to your future updates. Just saying thank you will not just be enough, for the wonderful lucidity in your writing. This blog contains a lot of informative data and news which i first time read from here. Thanks for writing about this important topic. I wanted to thank you for this great read I definitely enjoying every little bit of it and I have you bookmarked to check out new stuff you post. my eyes from your blog. This is good article, very informative and on the spot. I'm happy I stopped by and I'm very fond of the fact that I have learned something today. Keep up the good work. I admire the precious information you offer in your articles. I'll bookmark your blog and have my children check up here often. We are quite sure the can learn several new stuff here than anybody else! It's actually a great and helpful piece of information. I am happy that you shared this helpful information with us. Please stay us informed like this. Thank you for sharing. Sincerely, your post goes to the heart of the issue. I'm not that much of a online reader to be honest but your sites really nice, keep it up! I'm trusting the same best work from you in the future as well. Thanks! This is my very first time visiting here. I found numerous helpful stuff in your weblog especially the ongoing dialogue. From the tons of comments on your posts, I suppose I'm not the only person having fun in reading your website. Carry on the great work. Thanks for sharing this, you run a wonderful blog filled with good posts. I have bookmarked it for later use. Nice blog having nice information. some times we ignore this sort of things & also suffer a lot as well. However we can save a lot with the assistance of these tips for example time. Sometimes I sound like I’m arguing, when I’m actually not. I just have a way of putting my posts stronger than intended.It’s easier to keep out of the conversation and not take the chance of being misunderstood. Thanks for sharing this information, you have a wonderful blog filled with good posts. I have bookmarked it for later use. Great art what con i say about this amazing post very long but so interesting Generic Drugs. Thanks for post this. Natural sleep aids are the best solution for people struggling with sleeping problems. . Most of the people are very like it and enjoy it in this cup cake blogger so that can be enjoy it.So lovely and fantastic blogger shared on the site. Knowledgeable blogs are always welcome. This blog carries great informative material. I have read this post. Now my knowledge has been increase about above topic. Thanks to blog owner. I am hoping the same best work from you in the future as well. In fact your creative writing abilities has inspired me to start my own Blog, evdo wireless internet .